… and shot this picture from a hill at the opposite end of the beach. It takes just under 10 minutes to walk the full length of the sand. 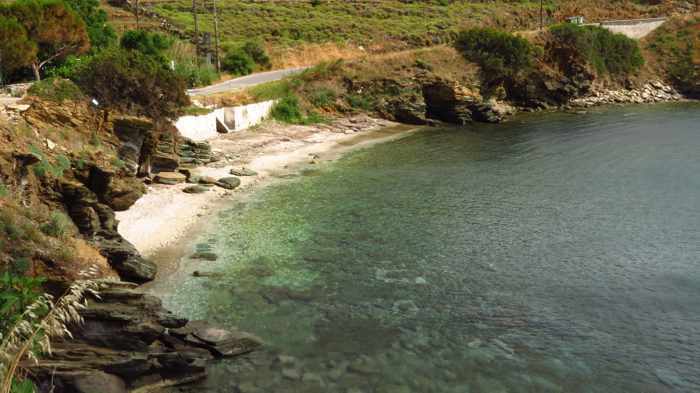 Five strands: Travelling to Andros this summer? Batsi village is an ideal base for swimmers or sun worshippers who want to stay within walking distance of several beaches and still have a good variety of places to eat and drink. The biggest, best and most convenient beach is right at Batsi — a long arc of golden sand that hugs the north shore of Batsi bay. Bars and restaurants are situated only steps away across the beachside road, while it’s just a short stroll from Batsi beach to the town’s main commercial area, which offers many more drinking and dining opportunities. Four more beaches are within reasonable walking distance of the village, making Batsi a perfect location for beach loving visitors who won’t have a rental vehicle during their stay (which was the case for us during our visit in late May). Kolona beach is located directly across the bay from Batsi harbour (you can see the golden sand crescent from the town’s waterfront), and is about a 15-minute walk from the northwest end of Batsi beach. It’s a scenic walk the entire way, since the route provides extensive views of the entire village and bay area, as well as surrounding mountains and the coast beyond Batsi. Heading south from Batsi, a 10-minute walk will bring you to Stivari, a strip of rental studios and apartments on a hillside overlooking a small bay. Stivari beach is a small pebble, stone and sand cove that’s more suitable for sunbathing than swimming, but it does offer impressive sea and sunset views, and it’s conveniently straight across the road from O Viomichanos / Stivari Gardens restaurant, where drinks and good food are served on a large tree-shaded terrace. 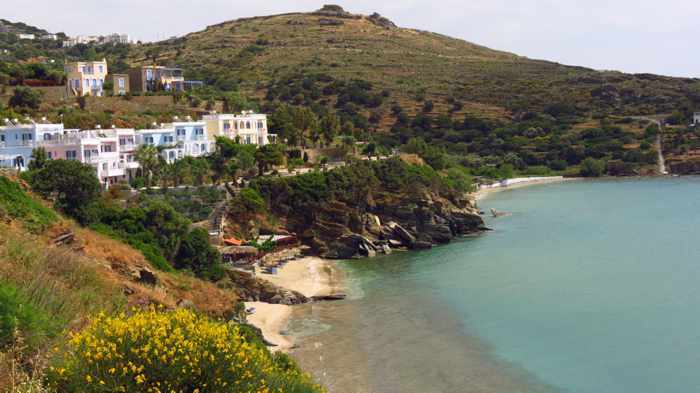 From Stivari, a 5-minute walk up and over the adjacent headland takes you to the Aneroussa Beach Hotel, where a stone staircase near the hotel’s driveway entrance leads down the hill to Delavoyia beach. 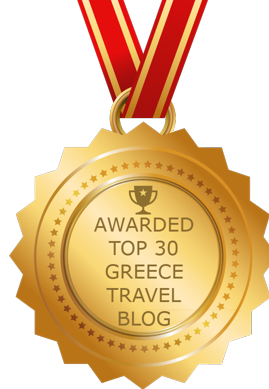 There actually are three small sandy coves here, separated by narrow outcroppings of smooth rock, and the hotel operates a cafe-bar on the biggest of the beaches. 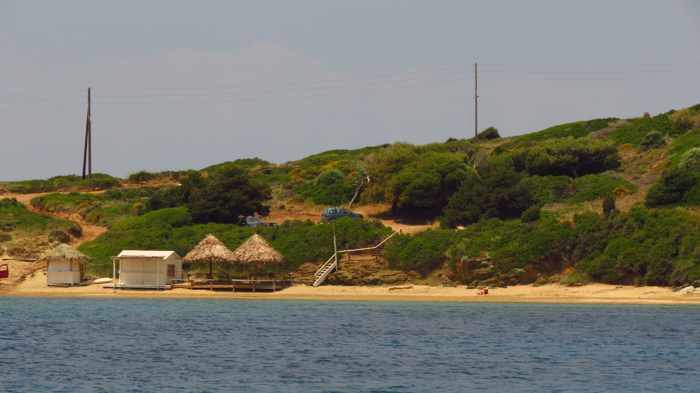 There are even more beach-hopping options for travellers with their own transport — several excellent strands are located a short drive away, along the highway linking Batsi to the port town of Gavrio. I will be publishing photos of those beaches in a separate future post. Click on the link below to see additional photos of all five beaches on page 2 of this post.